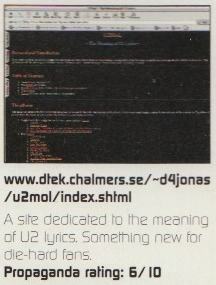 Propaganda listed eleven of the “best U2 fansites” in 2001—and U2MoL was one of them! It wasn’t until February 2013 that I got hold of a copy of the magazine, although I was told about it several years earlier (I am not sure it was in 2001, but it could have been), but now everyone can see the glory U2MoL has basked in. Quite soon after that I found myself in possession of the ability, and the possibility, of using the Internet, and the World Wide Web in particular, I started to look for information about (in my humble opinion) the best Rock-n’-Roll-band in the world; u2. This was in the autumn of 1994. Some month later I dawned on me that I knew what two of the songs was about – Pride and Angel of Harlem – but wanted to know what the others were about. I started in early 1995 with building a homepage for “The Meaning of U2 Lyrics” and started to ask in the two USENET newsgroups alt.fan.u2 and alt.music.u2 for others opinions and what they both thought and knew. I didn’t knew then that my page was the only one on the Web dedicated to the very core of U2: the message in their songs. Since then I have only stumbled upon a few other sites, two of them called Wisdom of Bono and Three Sunrises. They all tend to be short lived though. In the beginning I asked almost every second week and my throat became quite sore. But I’m happy to tell You, dear guest and reader, that that paid of. About this time I started to abbreviate “The Meaning of U2 Lyrics” into U2MoL and was was thinking on move the pages to a better location. Until now U2MoL had lived it’s life beneath “The Running U2 Archive”– an Yahoo-wannabe for U2 – (also known as RU2A) but during the summer of 1998 I moved it up one step in the directory-structure to the top level and decided to delete RU2A (it was not big, not good and I didn’t have the time nor inclination to maintain it). It was in this reconstruction that I decided to do some cleaning among the contributions. It was also now that I started to enforce my new policy on how to contribute and decided that I in the future would have some opinions about the text people sent me – if it wasn’t good enough I will reject it! This was entirely new – until then I had added almost everything people sent me and it sort of got out of hand. Now I try to add texts that explains what U2 meant, not what the song meant to one fan. I declared the new U2MoL finished on 16th of October 1998 around 6.30 pm CET and then deleted RU2A and the old U2MoL. What has happened since is that the site moved from my student account at the university (www.dtek.chalmers.se) to my ISP’s web space, hem.bredband.net, January/February 2003 and during 2003 and 2004 some layout maintenance has been performed (mostly the introduction of CSS for style handling). The contribution rules are still a working document, from time to time I receives flames that declare the rules stupid and impossible to understand, and I tried to rewrite them once or twice a year to make them more simple. But say the happiness that lasts… I had been thinking on making a number of enhancements to my entire site that all required scripting capabilities at the server side, and since my ISP had none of that, I had to take my site somewhere else. At the end of September 2007 did I buy myself some web hotel space and registered a domain, muorji.se and the migrations started at once. The year of 2007 was a year worth noting for other reasons as well. This was the year that I started to listen to U2 less and less and it didn’t take long before I didn’t consider myself a U2 fan any longer. I had created a blog where I could comment about U2MoL itself, the U2MoL (b)Log, or U2MoLog, and I wrote three posts there about why I stopped listening to U2. The U2MoLog is no more, but I collected the three posts in case anyone is interested. The U2MoL will live on for some time more, I am very reluctant to remove something that I have spent so much time on, is still visited and has been around since the Bronze Age of the Internet, the mid-1990ies. The most funny, and at the same time confusing, misunderstanding is that I write all the entries. That is plain wrong. Historically have I only written about ten per cent of the texts.